Now you can convert any van or similar vehicle into a recreational vehicle by using our VAN CONVERSION PLANS. The PLANS with our Van Conversion Manual cover all aspects of the job including the interior panels, cabinetry, plumbing, wiring, window installation, water systems, appliances, bunks, butane systems, and more. All details are provided so that even an amateur can get professional results. The PLANS include 6 different floor plan layouts which you can use or modify to suit your own needs, regardless of vehicle length. The Plans package consists of two pages of plans plus a 12-page Van Conversion Manual. 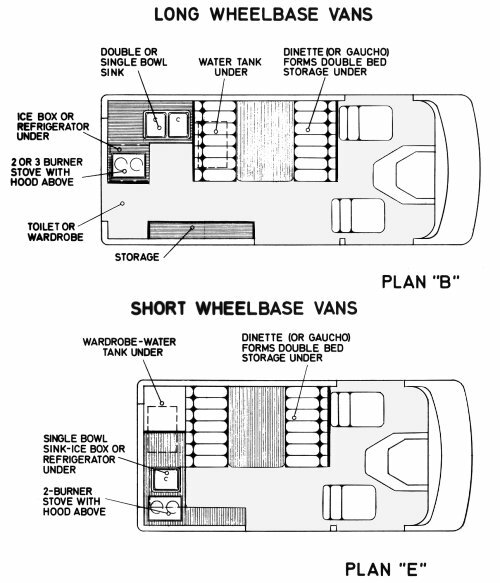 The following are headings from the Van Conversion Manual.